Explore locations from the book, the movie and beyond, with a customizable story based on your name. 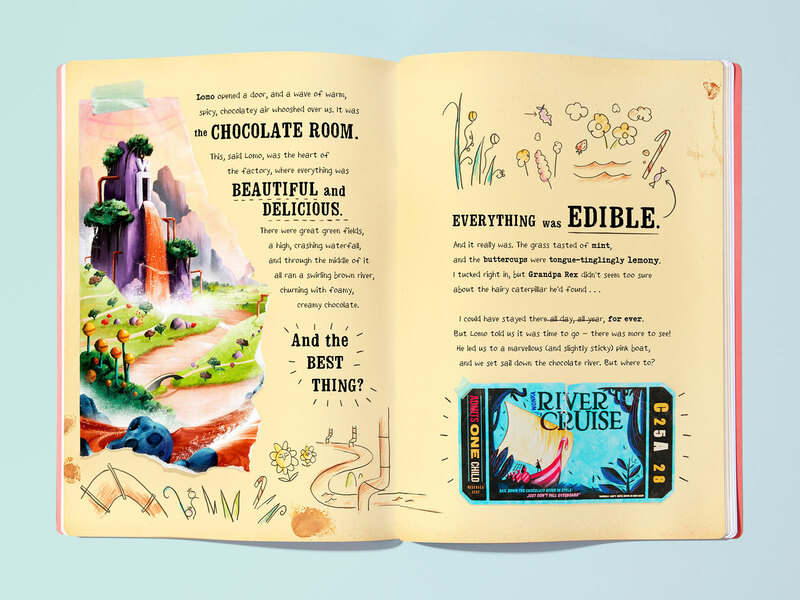 The Roald Dahl Literary Estate, in partnership with independent technology and children's publishing business Wonderbly, have created My Golden Ticket, a personalized adventure of "pure imagination" through one of literature and film's most famed food factories. The book itself serves as the reader's golden ticket, allowing him or her to move through the story as the "sixth" contest winner chosen to enter Willy Wonka's chocolate factory. Every book is tailored to the reader's name and can include customizations like dedications or an additional friend similar to the original story's guardians. The interactive adventure offers older fans a chance to explore some of the same rooms and inventions they know and love. That includes the Juicing Room, the infamous site of Violet Beauregarde's downfall. But Wonderbly's book goes a couple steps beyond a simple recreation of the well-known. Not only does the book allude to parts of Dahl's universe that were only mentioned on the page in passing—such as the rock candy mine and the toffee apple orchard—but it introduces entirely new locations and contraptions, like a Vitaministry or the Sound Hatchery. "Much of the world had been largely unexplored, and our approach was to take these and flesh them out, so everyone who read the originals could enjoy both, with no overlap, which it gave us a lot of freedom," Wonderbly founding partner, David Cadji-Newby, told It's Nice That. While many children's adventure books simply insert the reader's name into the story—like an ad lib—Wonderbly, formerly known as start-up publisher Lost My Name, has established a different approach to unraveling personalized plots. Your name is much more key to the story, as the entire direction from start to finish is based on the letters within it. Katy Balfour, story producer at Wonderbly, told It's Nice That that each room the reader enters is contingent upon the number of letters in their name. In total there are always 26 potential outcomes—one for each letter—in a room, in addition to a Family Tree, which adds your surname into the thick of it. There's apparently even an Oompa Loompa song for every name in the world. For example, as the adventure brings you to Wonka's Fizzical Effects Machine, the effects of the sweet that comes out are based on a letter in the reader's name. If the page is focused on the fourth letter in say Marie's name, she may become invisible or if it's the third letter, rubbery. 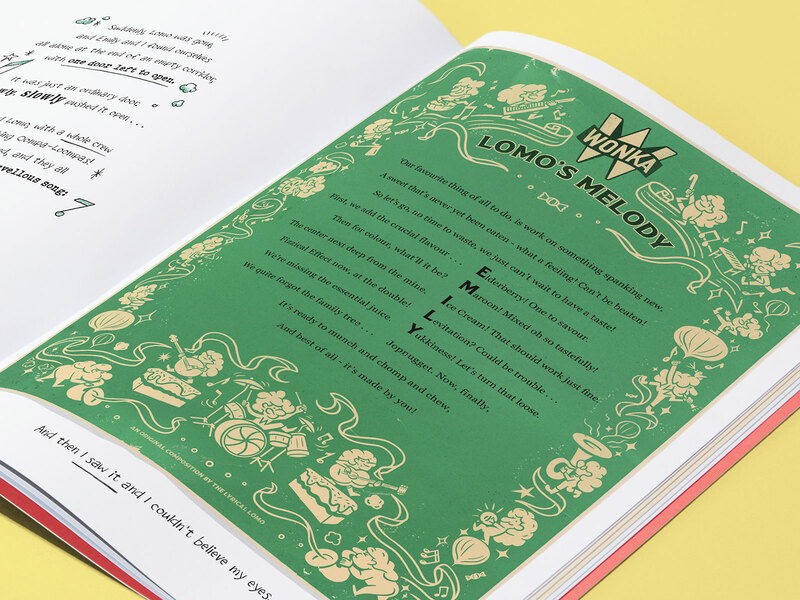 The book, which includes wrappers, packaging, and posters, has a scrapbook-like aesthetic and features visuals based on graphic design from the 1940s and 1960s, according to Adam Hancher, the book's art director and illustrator, offering it a colorfully vibrant and textured look. 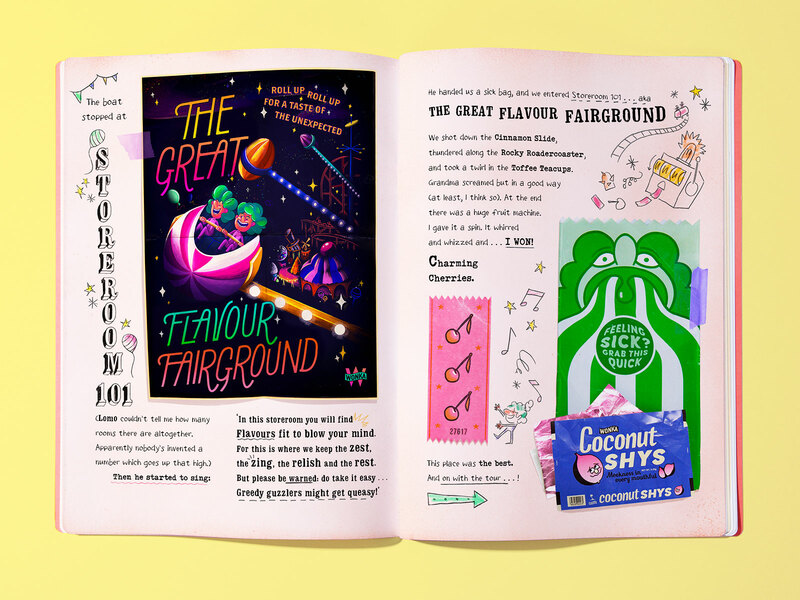 The pages feature an "in-house" designed Wonka brand identity, covering everything from lists, plans, blueprints, and rules. The front cover was even printed by a chocolate box packaging company. Sharabi describes the book as the company's "most ambitious … that we have ever published," incorporating Wonderbly's "creative technology" or software for data collection and analysis "to custom build a magical adventure." "I'm constantly reminded of the power of my grandfather's stories and how they have such strength that they can be reworked and reimagined and yet, vitally, stay true to themselves," managing director of the Roald Dahl Literary Estate and Dahl's grandson, Luke Kelly, shared with Adweek. "... This partnership with Wonderbly is an excellent articulation of that ambition." 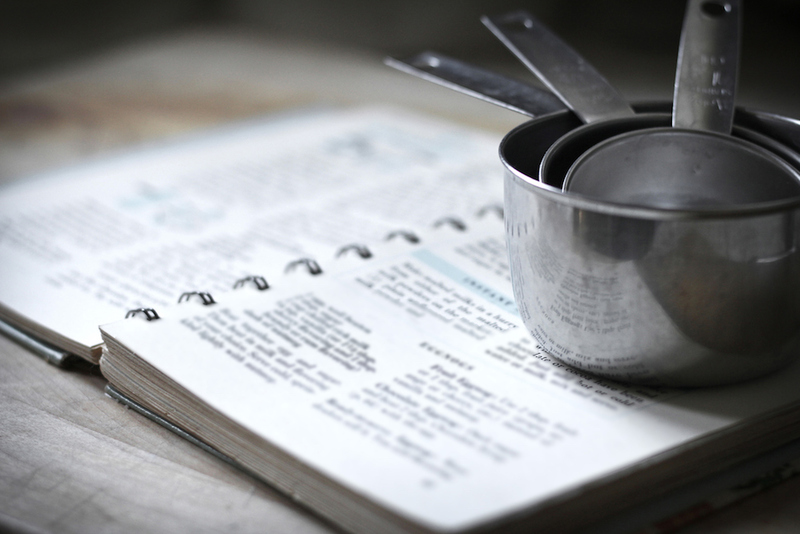 Each specially-made book runs between 36 and 40 pages and was officially made available for purchase on September 7, otherwise known as Roald Dahl Day. You can buy My Golden Ticket in both hard and soft cover through Wonderbly's website.